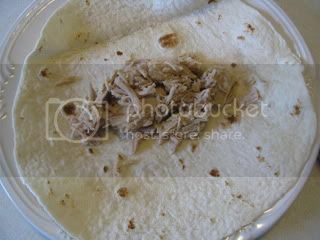 Last week on Menu Plan Monday, I included "pulled" pork grilled burritos. I'd cooked pork tenderloin in the slow cooker--with sliced onions, black pepper, a few ounces of plain tomato sauce mixed with water, and about a teaspoon of liquid smoke (I use Stubb's)--until it was tender. I chilled the drippings until the liquid gelled, spooned off the solidified fat, and added the gelatin to the chopped meat. (This freezes well; just thaw it before using.) 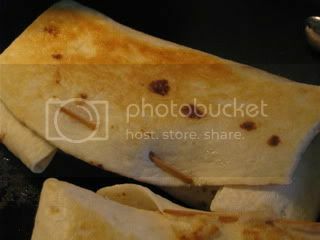 By popular demand (okay, one or two requests), I'm posting the recipe for the grilled burritos. 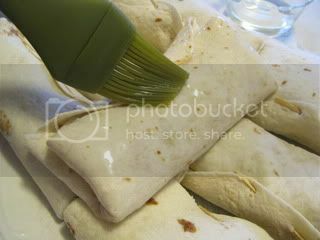 Spoon some filling onto a flour tortilla. 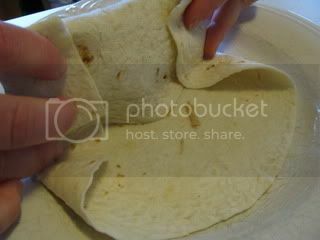 This is about 1/2 cup filling on a large tortilla. 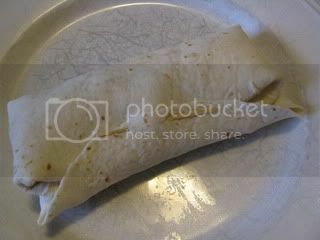 It could hold more, but overstuffing tends to make the burritos harder to handle. Fold over one side, then both ends; roll up. I hope the photo explains it better than I did! Secure with a toothpick. I try to be consistent--for example, use one toothpick per burrito--so we don't have any surprises later! ... and browned them in a skillet until they were golden brown and crispy. 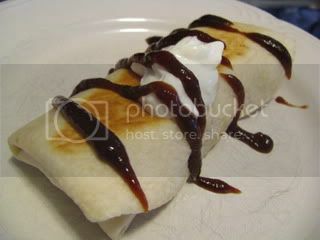 We serve these with BBQ sauce and sour cream. A little more liquid smoke would have given the meat more of a BBQ-like flavor, but my family declared these "really good." I'm linking up! For more recipes, click through to Tempt My Tummy Tuesday, Tasty Tuesday, Tuesdays at the Table, and What's Cooking Wednesday. oh goodness, that looks good! I'll be trying this soon...thanks! Those look great! Another good way to use pulled pork! Burritos are a big hit at our house. I have never made them with pulled pork though. I will have to give it a try! I've never tried making them this way, but I sure will now. Thanks for sharing this for WCW. That's a great idea for left over pork. Even if it wasn't pulled pork, chopping up left over chops would work too! But, I think I'd add in a little cheese :-D YUM-YUM!